Created in 1992 by Solani in North Carolina, USA. This dance expands the Great Central Sun into an even Greater Central Sun aligned with the Ultra Greater Reality. This energetic dance creates propulsion and is only performed when great energy is needed for a specific purpose. 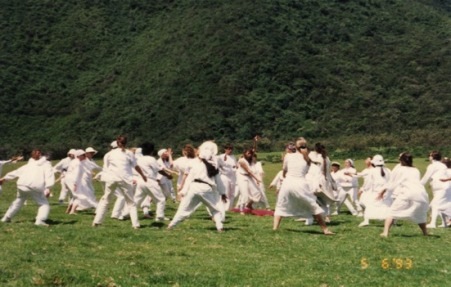 On special occasions, unique dances are performed in the center of the Greater Central Sun Dance. For example, a dance to stretch open the fabric of time and space. The Insertion Point Dance was birthed in the center of this dance during the Third Gate Activation. Photos of the Greater Central Sun Dance at the Second Gate Master Cylinder.